This weekend the nation will be remembering those who have been willing to make the ultimate sacrifice so that we, the people of the United States, could continue to live in peace and prosperity. It should be a very sobering day, and one that should be commemorated down through our generations. My own father served in WW II, and I have had the privilege to serve those who have served us through a ministry at one of the Fisher Houses at Fort Sam Houston. Those who have gone before us [and paid a price] should never be forgotten. I hope that everyone honors Memorial Day for what it really is: a day to remember and commemorate the people and events of our history. And in context of the Bible, the meaning of the Hebrew word for memorial is actually “to remember.” And God makes it very clear that He feels memorials serve a valuable purpose: to remind us of all He has done for us. One of my favorite passages in the Bible is Joshua 4:1-24. The Lord was finally delivering His People into their inheritance, and had appointed Joshua to lead the tribes of Israel across the Jordan River into the Promised Land. Joshua was given very specific directions ... have the priests carry the Ark of the Covenant ahead of the people into the Jordan, and God would stop the flow of the river (which always overflowed its banks during this harvest time). The priests were to stop on this dry ground, in the midst of the Jordan, while the people of Israel passed to the opposite shore. Then the Lord instructed Joshua to send one man from each of the 12 tribes of Israel to where the priests were standing, and to gather a rock from the riverbed. They were to bring them back to where the people were lodging on the west bank. The purpose for these 12 stones was very important to God: "Let this be a sign among you, so that when your children ask later, saying, ‘What do these stones mean to you?’ then you shall say to them, ‘Because the waters of the Jordan were cut off before the ark of the covenant of the Lord; when it crossed the Jordan, the waters of the Jordan were cut off.’ So these stones shall become a memorial to the sons of Israel forever." This very visible memorial would be a reminder to all future generations that the Lord of all the earth had delivered them out of the land of Egypt and into the Land that had been promised to their ancestor, Abraham. The memorial of stones would cause each succeeding generation to ask of their meaning. and then be reminded of all that the Lord of all the earth had done for them. It would be a lasting reminder and memorial forever of the goodness of God. But I love it that Joshua, himself, also erected a memorial in the middle of the Jordan, where the feet of the priests stood in the dry riverbed. Perhaps he wanted to offer a personal memorial to God, separate from the corporate one that would be erected on the west bank of the Jordan. But I think there is a much more consequential meaning to Joshua's actions. We must take note that once the priests continued with the Ark of the Covenant and set their feet upon dry ground on the opposite bank, the waters of the Jordan were released and this memorial was buried under the raging waters, never to be seen by anyone. Is there significance to this memorial, as well? Perhaps we can glean some meaning from the waters of the Jordan as being symbolic of judgment, just as the waters of The Flood condemned all corrupted flesh in Genesis 6; and the waters of the Red Sea buried the Egyptians; and Jonah was buried under the waters during his own judgment. Then there is Hosea 5:6, when God says, "I will pour out my wrath on them like water". If this is interpretation is a possibility, what is the difference between the two memorials? Why is one established in the Promised Land, and one is buried under the Jordan River? If water is judgment, then it makes sense to me that the memorial on the west bank is a picture of being saved from the waters of Judgment. The Ark of the LORD, which typologically points to Christ, stood in the midst of the Jordan, holding back the waters and allowing the stones to be brought up and erected on the shore as a memorial and sign of God's Deliverance. But the other memorial of stones was covered by the Jordan. They cannot be a sign because they cannot be seen. Those stones are a warning! It was Joshua alone (whose name means YHWH is Salvation) who did the work of setting up the twelve stones in the midst of the Jordan. It is not only Joshua's name that points to Jesus, but his actions. Jesus is the judge of the living and the dead. Those 12 stones are a warning about death and judgment! If people do not repent and trust in Jesus, they remain in the miry clay of a river— and that river will overflow in judgment at death. Those 12 stones represent the unredeemed, who have rejected Jesus and are buried in death by the righteous judgment of God… “and they are there to this day”. But here is the really sad part... they will never be seen or inquired about. They were quickly forgotten and there would be no evidence of them for the rest of eternity. As we celebrate the Memorial Day established by this nation, it is my prayer that we would share our own memories of what the saving grace of the Lord Jesus Christ has done in our individual lives. Don't let the unsaved think they are safe on whatever dry ground they are standing upon. Tell them how they can be saved from the waters of judgment. Tell them how, through the work of Jesus in saving and sanctifying them, they can be a memorial stone of remembrance of God’s goodness and saving grace. 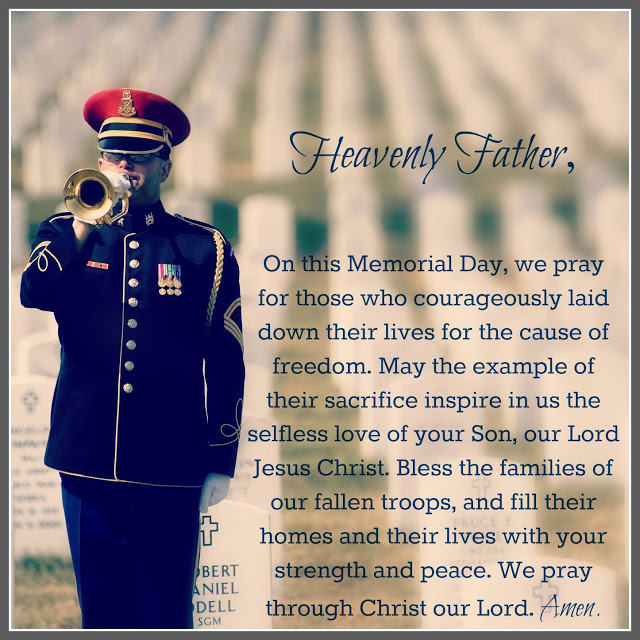 Let this Memorial Day mark a new remembrance of the work of the Lord in our nation.